LiquidOffice tasks can fail for a number of reasons. 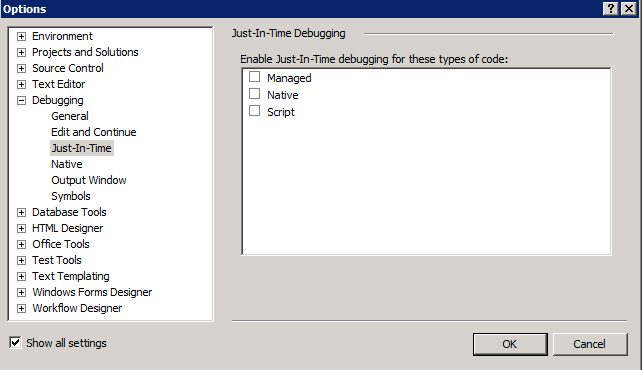 By default, a failed task halts the entire process and you will have to manually skip the task, delete the process or take some other action using Management Console. Sometimes, however, wouldn’t it be nice if the failed task waited a certain amount of time then retried? We have found this to be especially helpful for web service tasks. Calls to web services can fail if the server has gone offline for a minute, but could recover if tried in 10 minutes or so. So we have added an exception loop to each of our web service tasks that retries indefinitely. So we write a message to the log then try to set the value on a field that doesn’t exist. FAIL! The next task, Other Stuff, will never be reached in this particular example, but is representative of the rest of your process. The other four tasks are the interesting ones. First is an Exception task. An exception task is just a task that becomes active when the task it is connected to (with a red line) throws an exception – pretty straightforward. After the exception task we have placed a Delay task. This is the task that determines how long the process should wait before retrying. This code retrieves the failed task (whatever task you are attaching the exception loop too) and sets its’ state to READY. This command will fail if the task is not currently at state ABORT, so just make sure to only put this code inside your exception loop. The last member of this loop is the strangest, the Loop task. 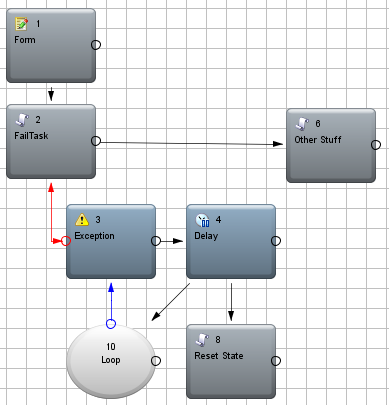 The loop task is between the Delay task and the Exception task and does NOT link back to the main process (Fail Task). Resetting the state of the Failed task immediately activates it (which is why we reset AFTER the delay task). The loop is only there to reactivate the exception task so that if the Failed task fails again, the exception loop starts over. In our example above the process will retry forever until it succeeds. You could easily add conditions to the loop task to determine how often it should run and this will be the equivalent of a retry count (since the exception task will never be reactivated). Adding these types of loops to your processes can help them to be more robust and keep you from having to intervene on recoverable tasks. UPDATE: Although the above guide can be greatly improve the reliability of your processes, LiquidOffice isn’t not a very reliable program. Depending on a variety of factors, Exception tasks themselves can have exceptions and there’s really no way to totally prevent these.